Looking for a job in logistics? Let this resume example help you write your own. To be the successful job candidate in any field, it helps to have a comprehensive resume. 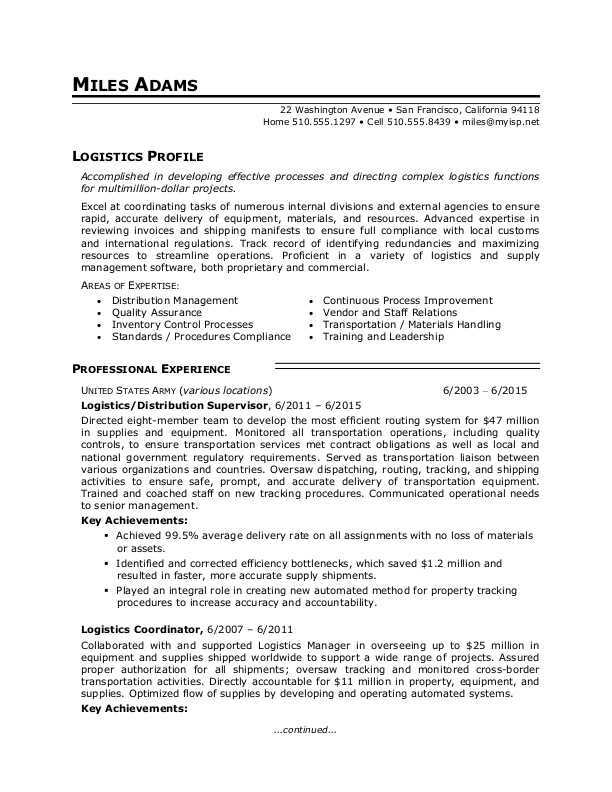 To help guide your own resume efforts, check out our sample resume below for a logistics professional making the transition from military to civilian work, and download the sample resume for a logistics professional in Word. Jobs for logisticians are projected to grow by 7% (or 10,300 jobs) from 2016 through 2026, according to the Bureau of Labor Statistics (BLS). You'll find the highest level of employment for this job in the following states: California, Texas, Michigan, Virginia, and New Jersey; and in the following metropolitan areas: Washington D.C., Los Angeles, New York City, Houston, and Chicago. As a logistician, you can expect to earn a median wage of $74,590 per year, or $35.86 per hour, according to the BLS. Additionally, you can learn more about logistics careers and search for logistics jobs on Monster. Accomplished in developing effective processes and directing complex logistics functions for multimillion-dollar projects. Excel at coordinating tasks of numerous internal divisions and external agencies to ensure rapid, accurate delivery of equipment, materials, and resources. Advanced expertise in reviewing invoices and shipping manifests to ensure full compliance with local customs and international regulations. Track record of identifying redundancies and maximizing resources to streamline operations. Proficient in a variety of logistics and supply management software, both proprietary and commercial. Directed eight-member team to develop the most efficient routing system for $47 million in supplies and equipment. Monitored all transportation operations, including quality controls, to ensure transportation services met contract obligations as well as local and national government regulatory requirements. Served as transportation liaison between various organizations and countries. Oversaw dispatching, routing, tracking, and shipping activities to ensure safe, prompt, and accurate delivery of transportation equipment. Trained and coached staff on new tracking procedures. Communicated operational needs to senior management. Achieved 99.5% average delivery rate on all assignments with no loss of materials or assets. Identified and corrected efficiency bottlenecks, which saved $1.2 million and resulted in faster, more accurate supply shipments. Played an integral role in creating new automated method for property tracking procedures to increase accuracy and accountability. Collaborated with and supported Logistics Manager in overseeing up to $25 million in equipment and supplies shipped worldwide to support a wide range of projects. Assured proper authorization for all shipments; oversaw tracking and monitored cross-border transportation activities. Directly accountable for $11 million in property, equipment, and supplies. Optimized flow of supplies by developing and operating automated systems. Key player on team that consistently exceeded stated objectives on all projects. Led smaller teams in developing effective stocking and inventory-management systems to minimize loss and maximize performance. Coordinated with staff regarding relocation and transportation arrangements. Prepared documentation and coordinated transport of resources and materials. Marked and labeled freight; documented, verified, and inventoried cargo; and prepared and submitted report documentation. Maintained accurate records and managed office correspondence. Earned multiple awards for quality and dedication of performance in rapidly changing, fast-paced environment. As a logistics professional, you're used to balancing a variety of responsibilities, and knowing when to prioritize one thing over the others. Your resume needs to display the same kind of know-how. Make it too laden with details, and your appeal might get lost; but if it's too light on the details, you could be seen as unqualified. Could you use a professional assessment to kick-start your job search? Get a free resume evaluation today from the experts at Monster's Resume Writing Service. You'll get detailed feedback in two business days, including a review of your resume's appearance and content, and a prediction of a recruiter's first impression. Make sure you're delivering the goods that will get you hired.